Just because a travel humidor’s primary function should be first and foremost the protection and humidification of cigars, it doesn’t mean a travel humidor has to be big, bulky and unappealing to the eye. That’s where the Amancy Cedar Wood Llined Portable Travel Cigar Humidor comes in. Beautifully modern, yet timeless in its form and function, this exquisite 5-cigar travel humidor has something to offer everyone. The shapely Amancy Cedar Wood Lined Portable Travel Cigar Humidor is a well-built cylinder-style humidor which is cloaked with an eye-catching poly synthetic leather, which isn’t as ideal perhaps as genuine leather, yet you will be less concerned with the normal spills, tears, bumps, and bruises the travel humidor will pick up along the way that might otherwise have you cringing. 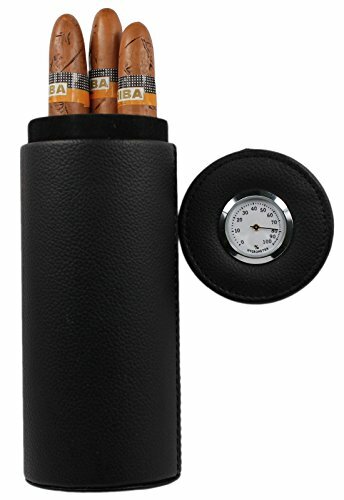 A hygrometer is located on the outside of the lid, making it easy to eyeball the humidity without having to crack open the humidor. The lid itself is not permanently attached to the body of the humidor, nor does it lock into place when closed, so while it is fairly snug, you will still want to be mindful of how you pick it up, carry it or pack it away. When the lid is removed, you will find a cedar-lined interior and humidifier that perfectly accommodates up to 5 decent sized cigars. As with any compact humidor, over-humidification can prove a common frustration. The Amancy Cedar Wood Lined Portable Travel Cigar Humidor is no different, yet this is easily averted with a little practice. Backing off on humidification will especially deliver more favorable results to those in more humid climes. Once that happy medium is reached, however, this wondrously compact travel cigar humidor proves to be a fantastic performer. 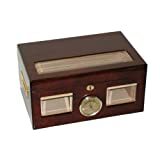 Perfect for those in need of a small travel cigar humidor that will do the job nicely and do it with style, the Cedar Wood Lined Portable Travel Cigar Humidor from Amancy is the ultimate choice. 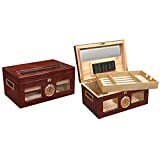 Whether you need a humidor for that weekend getaway or you are a casual cigar enthusiasts who simply needs a humidor to keep a few cigars in now and then, the cheap price is tough to beat! Amazon Affiliate Disclosure Notice: It is important to also note that cigarhumidorguy.com is a participant in the Amazon Services LLC Associates Program, an affiliate advertising program designed to provide a means for website owners to earn advertising fees by advertising and linking to amazon.com, endless.com, smallparts.com, myhabit.com, and any other website that may be affiliated with Amazon Service LLC Associates Program.